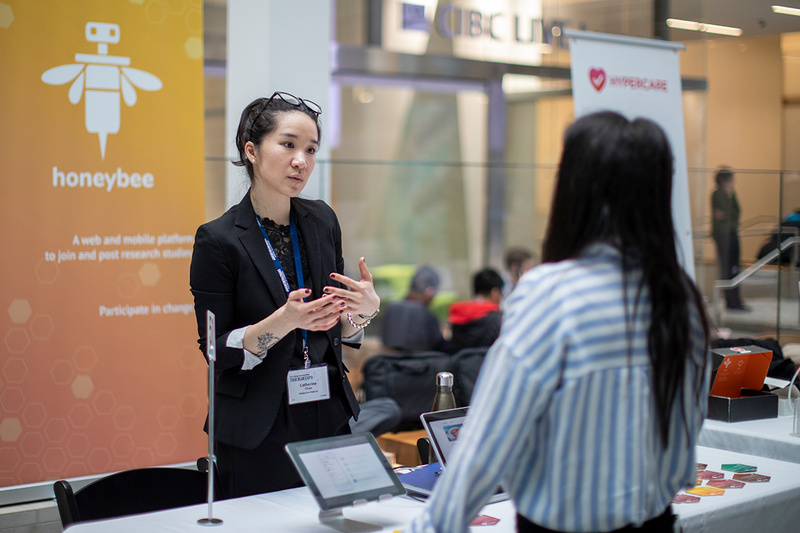 From facial fracture-mending “bone tape” to counterfeit-stymieing authentication technology, the ingenuity of University of Toronto startups was on full display Thursday during an Entrepreneurship Week event held at the MaRS Discovery District. Dozens of U of T entrepreneurs staffed booths in MaRS’s airy indoor concourse on College Street as part of the True Blue Expo. They spent the day fielding questions about their startups and the often challenging problems they are seeking to solve. In the case of Nanology Labs, that includes nothing less than brain cancer. The startup took home a $25,000 first prize in the “late-stage” category of an RBC-sponsored pitch competition for its injectable MRI contrast agent built using nanotechnology. “Current MRI contrast agents aren’t very sensitive … and they’re toxic,” co-founder and CEO Mohammad Ali Amini explained to a panel of judges. Ali Amini, who is finishing up a PhD at U of T in pharmaceutical sciences, showed a slide that compared MRI scans of a mouse’s skull. The scan using Nanology’s nano-contrast agent spotted the brain tumour that lurked within. The scan performed with a conventional Gadolinium-based contrast agent did not. Other startups that took home money in the RBC Prize for Innovation and Entrepreneurship included: Puremark ($10,000), which uses a software-based authentication technology to protect high-end western brands from being counterfeited in markets like China; Cohesys ($10,000), which makes a flexible “bone tape” that can be used instead of titanium plates and screws to repair facial fractures; and Sirona Onsite ($5,000), which is building a platform to deliver eye exams and other vision services to people’s homes. Earlier in the day, U of T also announced the recipients of the commercialization-focused RBC Post-Doctoral & Graduate Fellowships, which spanned disciplines ranging from machine learning and advanced data analytics to security. There were a total of seven fellows this year – five graduate and two post-doctoral – the most ever awarded under the program. Not all of the startups on display were high-tech in nature. Diva Turial is the founder and co-ordinator of Lead with Dignity, a social impact startup that’s hoping to alleviate homelessness, mental health and other related issues in Ontario and further afield, including in Afghanistan. How? By offering employment support and, in particular, micro-lending strategies to help people launch their own small businesses. Lead with Dignity is being supported by U of T’s Health Innovation Hub, or H2i, one of nine accelerators on campus. Other on-campus accelerators include the Creative Destruction Lab, Impact Centre, UTEST, The Hub (U of T Scarborough), ICUBE (U of T Mississauga), The Entrepreneurship Hatchery, Start @ UTIAS and the Department of Computer Science Innovation Lab, or DCSIL. U of T’s expanding entrepreneurship infrastructure – a new, 14-storey U of T innovation centre will break ground this summer across the street from MaRS – has helped launch over 500 companies over the past decade, generating more than $1 billion in investment. “The U of T entrepreneurship community is Canada's leading engine for research-based startups,” Vivek Goel, U of T’s vice-president of research and innovation, told attendees at one of the RBC events. “In all sectors and across our three campuses, our faculty and students are building on U of T's world-class excellence and research talent. "They are getting their ideas into the marketplace in the form of products, services, jobs and companies that are contributing to the Ontario and Canadian economies around the world." U of T startups will now also have even more help after the university announced Thursday the launch of a new True Blue Fund, which will provide up to $5 million in financial support. The day’s keynote, part of the RBC Innovation & Entrepreneurship Speaker Series, was a chat with Michael Katchen, the co-founder and CEO of the millennial-focused investing firm Wealthsimple. Katchen recounted how he went to work for Ancestory.com in Silicon Valley, but ultimately moved back to Canada and launched his own company. He said he got the idea for Wealthsimple, a robo adviser that uses software to make investment decisions instead of fund managers, after his team at Ancestory.com wanted him to help them manage their personal finances. “We saw this opportunity to remove the barriers to getting people access to the [financial] tools they really need,” he said. Now with over 100,000 clients and $3 billion in assets under management, Katchen offered aspiring entrepreneurs a few pieces of advice – some of them counterintuitive – to building a successful startup. First, he repeated a Silicon Valley mantra of the need to launch quickly and fail fast. Too often, he said, startups waste precious time perfecting a product only to find out nobody wants what they’re selling. He also highlighted the importance of finding people you “love to work with,” saying that’s potentially even more important than working on a project you’re particularly passionate about. Finally, and somewhat unexpectedly, Katchen recommended that entrepreneurs “do things that don’t scale.” As an example, he referred to his decision, in Wealthsimple’s early days, to pick up the phone and personally call each new client – a time-consuming practice that was impossible to maintain as the company grew. “I don’t think we would have gotten our first 1,000 clients if we hadn’t done that – if we would have instead focused on our first 10,000 clients,” Katchen said.